US researchers have incorporated carbon nanotubes into organic light-emitting transistors (OLETs) to create devices that rival the performance of their silicon counterparts. This technology could lead to much larger flat screen televisions and displays, which are also cheaper to manufacture. Organic light-emitting diodes (OLEDs) produce brighter light than liquid crystals and are cheaper to make than inorganic LEDs. 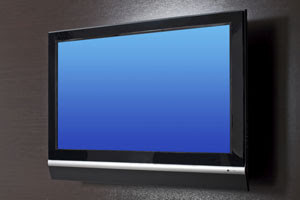 This makes them a promising alternative for large flat screen displays. Polycrystalline silicon transistors - semiconductor devices used to amplify and switch electronic signals - are used to make up the backplane of OLED electronic displays. However, it is difficult to make uniform polycrystalline silicon grains and this limits the size of display you can make. Now a team of researchers, led by Andrew Rinzler at the University of Florida, Gainesville, has tackled this problem by adding a thin network of carbon nanotubes to a transistor. This transistor can perform the switching functions an electronic display needs at very low voltages. 'The goal is to allow people to build bigger screens. We have opened up the field to be able to exploit a whole new class of materials in these devices, to overcome the limitations of polycrystalline silicon,' says Rinzler. 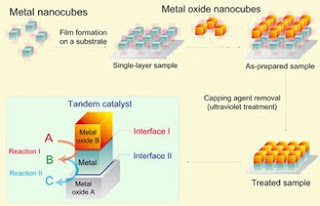 The team took the design one step further and incorporated an OLED layer into the carbon nanotube-based transistor to produce an efficient OLET - a device that acts as both a transistor and light source for an electronic display. 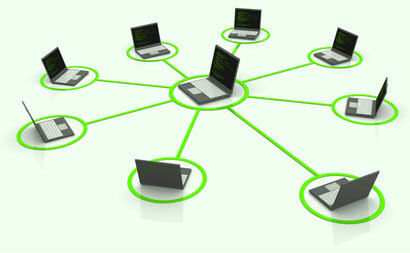 The device comprises a network of carbon nanotubes mounted on a thin dielectric layer. The device is sandwiched between two electrodes and the organic light emitting material sits on top. Passing a small current through the device provides enough power to produce different coloured light. By adding different organic semiconductors the team were able to produce red, green or blue light without the need for a separate transistor and OLED. Rinzler believes that his OLET design could be commercialised in the near future. His team plan to build arrays of OLET-based pixels to check that the carbon nanotube technology can be scaled up for big screens. 'Our goal is really to demonstrate all the pieces for a display manufacturer to look at this technology seriously,' he says. Researchers in the Netherlands have created a polymer that folds up like a protein on exposure to light.1 Non-covalent interactions are responsible for the collapse of the polymer, but while hydrophobic interactions drive protein folding, hydrogen bonding folds the polymer. 'Natural polymers, like proteins, are functional due to their highly ordered well-defined three-dimensional structures,' says Tristan Mes of the Eindhoven University of Technology. 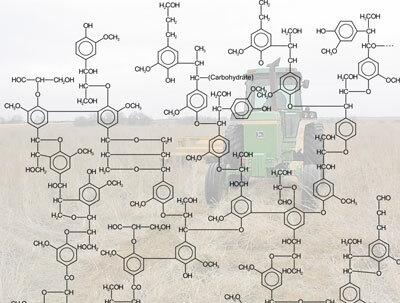 Mes' synthetic polymer is packed with benzene-1,3,5-tricarboxamide (BTA) side chains that are connected by hydrogen bonds. Normally, these pull the polymer in on itself around a chiral centre of stacked BTA. By photoprotecting the BTA with nitrobenzyl groups, the team added a trigger so that the folded polymer could only be obtained by external stimuli. Shining UV light on the polymer cleaves the protecting groups, causing it to fold up. But Andrew Wilson of the University of Leeds, UK, says he is not so sure. 'I think what's really cool is that you get different degrees of H-bond mediated collapse depending on irradiation time and temperature - this hasn't really been demonstrated before and is of course a function of biological macromolecules.' But Wilson is unsure that folding is the right word for what the polymers do, explaining that pulling apart the polymer and allowing it to collapse will lead to a different superstructure each time, unlike proteins. Mes and colleagues have also harnessed hydrophobic interactions in water to fold a BTA polymer intramolecularly.2 This folding bears a closer resemblance to that of the proteins which they are trying to mimic. In this case, these BTA polymers are wrapped around a catalytic ruthenium core to make a polymerisation 'enzyme'. Mes says the group now hopes to make artificial enzymes for asymmetric catalysis by using a chiral core of stacked BTA moieties. A nickel-based homogeneous catalyst that breaks down lignin - the tough polymer that forms plant cell walls - into useful building blocks suitable for chemicals, including green fuels, has been developed by US scientists. The team says that the nickel catalyst is more efficient than current heterogeneous catalysts, although industrial applications are still some way off. The search for efficient biomass conversion methods to produce useful, green and sustainable products has gained much ground in recent years. However, a major obstacle has been that the main components of biomass - namely cellulose and lignin - are tough polymers that do not break down easily. 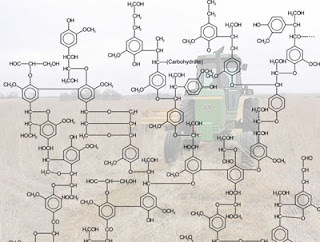 Lignin comprises a network of ring-like monomeric nine carbon hydrocarbon units that are principally connected by C-O bonds. 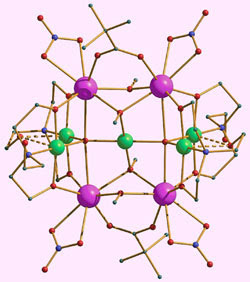 Cleaving these bonds without breaking open the individual ring structures is crucial to produce useful chemical building blocks, rather than a mixture of short chain hydrocarbons. Previous systems for cleavage of aromatic C-O bonds in aryl ethers were based on heterogeneous catalysts that require high pressures and temperatures. Furthermore, these systems work by competing C-O bond cleavage and hydrogenation of the aryl ring, leading to complex mixtures, which wastes hydrogen. Now, Alexey Sergeev and John Hartwig at the University of Illinois at Urbana-Champaign, US, have developed a homogeneous nickel-carbene catalyst which selectively cleaves aromatic C-O bonds in various aromatic ethers without reduction of aromatic rings or cleavage of aliphatic C-O bonds. In addition, compared with other catalytic systems, theirs functions at lower temperatures and pressures. 'We were surprised that such a simple catalyst is able to do such a challenging transformation of a number of unactivated aryl and benzyl ethers with such high selectivity,' says Hartwig. 'Because the catalyst is able to cleave aromatic C-O bonds in aryl ethers selectively, it could allow the production of nine carbon arenes from lignocellulosic biomass. These arenes can be used for the production of chemicals or, ultimately, green transportation fuels,' he adds. However, before the catalyst is ready for industry the system needs to be made more practical by decreasing catalyst loadings by several orders of magnitude. The catalyst's stability in the presence of moisture also needs to be improved as biomass tends to have a high water content. 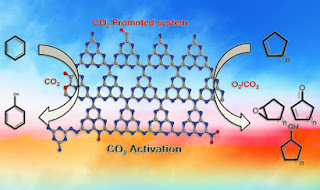 Carbon dioxide enhances the catalytic oxidation of cyclic alkenes, leading to higher conversions at low pressures, say researchers from South Korea. 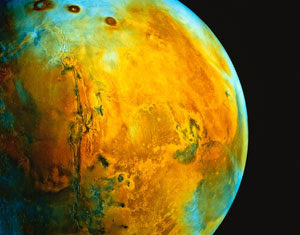 The system could be a step towards new technology for using CO2 at low pressures. 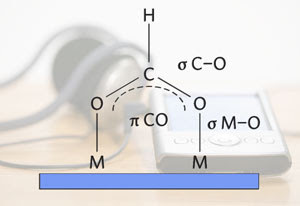 Sang-Eon Park and coworkers from Inha University, Incheon, prepared carbon nitrides that contain surface groups to activate the CO2, which was then used to promote the oxidation reactions of several cyclic alkenes. CO2 is being recognised as an alternative and economic resource for use in organic reactions and it has been used in catalytic reactions, either as a solvent or a reagent. However, in most cases, it is used in a dense phase or under supercritical conditions, which require high operating pressures and have low reaction rates. The team tested their system by oxidising different cyclic alkenes with various amounts of oxygen, with and without CO2, and compared the results. They found that the presence of the CO2 increased the conversion percentage in all cases. The CO2 acts as an oxygen source, which is inferred from the formation of carbon monoxide and surface carbamate. The team was also able to reuse the catalyst up to three times. Chang-jun Liu from Tianjin University, China, an expert in catalysis and the use of greenhouse gases, says that using 'high nitrogen containing carbon nitrides to enhance the oxidation of cyclic olefins with CO2 as a soft oxidant' is significant. Liu adds that the work could lead to an easy approach for CO2 conversion with the production of highly-valued chemicals. Park's team now hopes to fully understand the reaction mechanism, explaining that this will help them to design a more appropriate catalyst. 'Further spectroscopic and computational studies are in progress and hopefully, very soon, a complete insight over promotional aspects will be revealed,' concludes Park. Scientists in the UK have shown that two major industrial processes that generate large amounts of carbon dioxide could usefully be linked together to deliver significant savings in energy and CO2 emissions. 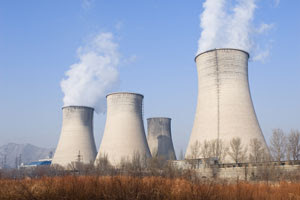 For several years researchers have investigated ways of capturing and concentrating CO2 from fossil fuel power stations so that it can be trapped, possibly in underground rock formations. One promising method involves reacting the flue gases with calcium oxide. The CO2 in the exhaust gas combines with CaO to form calcium carbonate, CaCO3. This can then be heated to drive off the CO2 at a much higher concentration. The process regenerates CaO, which can be used for further cycles. Typically flue gases contain around 15 per cent CO2, which can be concentrated to around 95 per cent through this 'calcium looping' process. After repeated cycles the CaO undergoes morphological changes which reduce its efficiency for producing CaCO3. It has been suggested that this spent CaO could be used as a feedstock for the production of cement. 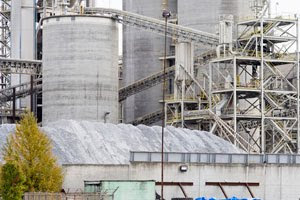 The cement industry requires a large amount of CaO, which is produced by heating calcium carbonate in the form of limestone, which in turn produces significant CO2 emissions. However, it has not been clear if the CaO derived from the calcium looping cycle would be suitable for cement manufacture. Now, Charles Dean, Denis Dugwell and Paul Fennell, from Imperial College London, have carried out laboratory scale tests that suggest that spent CaO sorbent from CO2 capture retains the appropriate chemistry for its inclusion in cement, with no detrimental properties to the final product. 'If you take off a purge stream of calcium oxide from the calcium looping cycle, it should be possible to feed this directly into the cement works,' says Fennell. 'This would save about 50 per cent of the CO2 produced in production.' The requirement for less energy to generate the CaO from limestone would also create significant cost savings. 'We have shown for the first time that cement can be successfully produced from CaO previously used in the calcium looping cycle, thereby confirming a positive synergy between the two processes,' says Fennell. Scientists in Australia and Germany have used living cells as 'factories' to encapsulate particles such as drugs in biological membranes. The system could be used in the future as a biocompatible drug-delivery vehicle that could evade the body's immune and excretory systems, the scientists suggest. Dayang Wang of the University of South Australia and Adelaide, and colleagues showed that certain hydrophobic molecules, including drugs and dyes, can diffuse across the membranes of cultured human or mouse cells. These molecules are then acted upon by enzymes in the cell to create the active hydrophilic product, which because of its water loving properties can remain in the cell's cytoplasm. 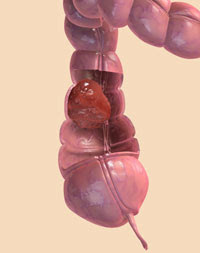 The next stage is to parcel up these particles within much smaller membrane capsules. The researchers did this by exposing the cells a substance called cytochalasin B, which disrupts the internal scaffolding of the cell, its cytoskeleton. 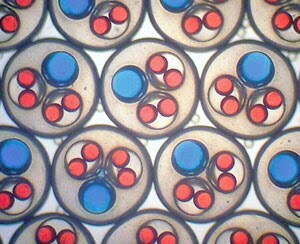 When the cells are then shaken, the membrane breaks up into many smaller hollow spheres, typically 1-2 micrometres in diameter, containing the introduced molecule. The team showed that the membrane proteins, including receptors and ion channels, remain in the membranes of the smaller vesicles, and that these can, in certain circumstances, be stimulated by an appropriate biochemical cue to release the contents of the vesicle. The team showed that the vesicles can largely evade the attention of macrophages, cells which circulate in the blood and mop up foreign particles. Researchers in the US have developed a new approach for controlling crystal growth, borrowing tools from biology. In the 'capping' method, crystals are shaped by binding molecules to preferred facets, inhibiting their growth and directing atoms to pack onto the uncapped facets. The capping molecules must sense the subtle variations in the surfaces of different crystal facets. For instance, the atoms on the face of a platinum cube are in a face-centred cubic arrangement, but those on a tetrahedron are hexagonal. The discovery of such discriminating molecules has been haphazard, which has led Yu Huang of the University of California Los Angeles and her colleagues to propose a new approach. 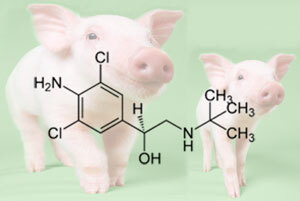 Huang's team turned to biology's millions of years of experience in developing molecules with very specific binding tastes. They used a technique known as 'phage display', in which peptide sequences, from a library of a billion different combinations, are encoded into the DNA of viruses. Those peptide sequences appeared as proteins in the virus membranes, and by exposing the viruses to a particular crystal facet, the researchers could discern how well they attached. The team selected two peptide sequences this way, one which bound to platinum cubes and the other to octahedra. To make the crystals, Huang and her colleagues mixed chloroplatinic acid with peptides. 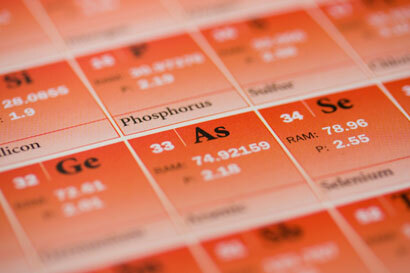 A shot of sodium borohydride reduced the platinum ions suddenly, kicking off crystal growth. By the end of thirty minutes, 70 per cent of the crystals bound to the octahedron's peptide sequence had become tetrahedra, a shape with identical facets. 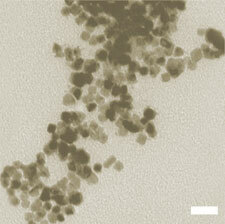 The peptide for cubes had a similar success rate, forming crystals with 7.5nm dimensions. Although the binding mechanism is unknown, the researchers conjecture that the aromatic group on the tetrahedron peptide may prefer the hexagonal formation of the platinum ions. They also suggest that oxygen of the hydroxyl groups at the end of the other peptide sequence may be bridging two adjacent platinum atoms on the cube surface. Major chemistry funders in the US, including the National Science Foundation (NSF) and the Department of Energy (DOE) Office of Science, will see their funding shrink under the budget agreement covering the remainder of fiscal year (FY) 2011, which ends on 30 September. 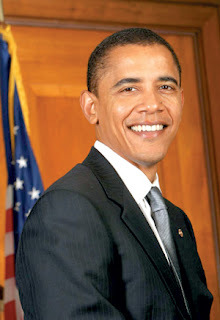 Brokered more than half a year late, the deal reached by Congress and the Obama administration on 8 April came just in time to avoid a government shutdown. "Science agencies did pretty well in comparison with the others"
The Obama administration says it no longer plans to keep the budgets of the key physical science agencies on a trajectory to double between 2006 and 2016, but it is still vowing to provide them with 'strong investments'. Under the long-awaited arrangement, the NSF will have a $6.9 billion (£4.2 billion) budget, representing a $53 million drop compared with the previous year. The figure is $550 million under the President's request but $307 million over the original House proposal. Specifically, the NSF research accounts will be shaved by $43 million, or 0.8 per cent, and the education and human resources budget cut by $10 million, or nearly 12 per cent. Meanwhile, the DOE Office of Science was spared the billion dollar reduction proposed by the House. Instead, the office - which funds the US national laboratories - will see its budget fall to $4.9 billion, representing a drop of $20 million. The US National Institutes of Health (NIH), which under the House proposal would have lost $1.6 billion, will receive a $31 billion budget, representing a decrease of $260 million, or 0.8 per cent. Specifically, $50 million is being taken from the agency's buildings and facilities account. Congress has approve these final appropriations for FY2011. 'It could have been much worse, but overall science agencies did pretty well in comparison with the others,' says Pat Clemins, who heads the budget and policy programme at the American Association for the Advancement of Science. For example, the Environmental Protection Agency saw its funding slashed by $ 1.5 billion, or 16 per cent. 'Now it is up to the scientific community to show that this was a good idea and to spend the money wisely,' Clemins adds. The American Chemical Society (ACS) has already turned its attention to the FY 2012 budget and beyond. The House Budget Committee blueprint for FY 2012 contains what appears to be predictable and sustained funding for many of the US science agencies. But those plans now appear to be in doubt. Spokesperson Glenn Ruskin says the ACS is 'taking a wait and see approach'. A US group of researchers has made a round bottomed flask from folded up DNA with an internal capacity of just 24000nm3, which would be enough to hold 800,000 molecules of water. 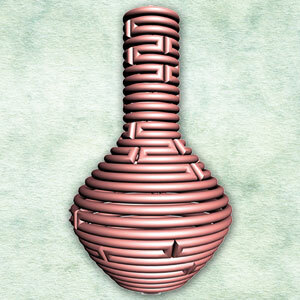 The flask is 70nm high and 40nm wide and was made by stacking different sized rings of DNA on top of each other - the way in which so-called coil pots are made out of clay. 'We are inspired by both Nature and engineered architectural objects' says Hao Yan, one of the group members at Arizona State University, US. Yan says Nature is full of objects with delicate curvatures. Scientists have used DNA 'origami', in which DNA is used as a structural material, to make rings before. But varying the size is difficult because DNA prefers circles with 10.5 base pairs per turn, and stacking those would just give a tube. Yan and colleagues found a way to control the folding of DNA to make bigger and smaller rings, as well as half rings, and used those to build up their 'nanoflask'. Paul Rothemund at California Institute of Technology, US, who did much of the early work on DNA origami, says he is impressed by the flask. Research on DNA structures is moving very fast, he adds. Of course, flasks made from DNA are unlikely to replace traditional glassware in the lab, but Yan and Lui say that the technique could be used to make templates for nanocrystals, artificial enzymes or capsules for drug delivery. The team is now also working to make more elaborate structures from longer lengths of DNA, but they say that, for that, the pen and paper they've been using up until now might have to be traded in for computer-aided design software. 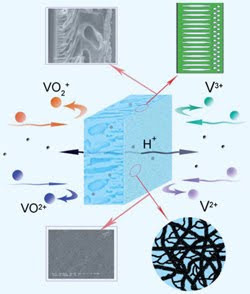 Scientists in China have found that nanofiltration membranes could enhance the efficiency of vanadium redox flow batteries (VRBs) making them a more viable tool for large-scale energy storage. Xianfeng Li from the Chinese Academy of Sciences in Dalian and his team made the membranes, which separate two components in the batteries, from polyacrylonitrile. Pores in the membrane can be adjusted, allowing scientists to have more control over the ions passing from one side of the battery to the other during charge-discharge cycles, improving the battery's performance. The random and intermittent nature of renewable wind and solar energy sources can limit the power output quality, says Li, who adds that 'energy storage is the key to solving this problem.' VRBs can store a significant amount of energy. In these batteries, two electrolyte tanks, containing species of vanadium in different valance states, are separated by an ion exchange membrane. When the battery is charged, the vanadium ions are oxidised or reduced, converting chemical energy into electrical energy. Ion exchange membranes should prevent the crossover of vanadium ions, while allowing protons to pass through. But the ones most commonly used - perfluorinated polymers such as Nafion - let vanadium ions through and are expensive to buy, despite showing high proton conductivity and chemical stability. Other low-cost membranes need additional ion-exchange groups, which lower their stability. The difficulty in finding a suitable membrane has limited the commercialisation of VRBs, Li explains. The team adjusted the polyacrylonitrile membrane's pore size distribution by varying the polymer concentration. They measured their membrane's selectivity between vanadium ions and protons by placing the membrane in a cell with vanadyl sulfate in sulfuric acid on one side and deionised water on the other. They collected samples from the right side over time and analysed them with a UV-visible spectrometer and a pH meter. They found that the membrane showed increased selectivity for protons over vanadium with a smaller pore size distribution. They observed that the performance was comparable to Nafion, but at a lower cost. John Varcoe, who develops systems for clean and sustainable energy generation at the University of Surrey, UK, says that using nanofiltration membranes in redox flow batteries is 'an exciting new development in the field'. 'The simplicity of the system does not lead to a sacrifice in performance and efficiency,' he adds, but he points out that further stability tests are needed. After forced power cuts last year in a bid to save energy, China has released more realistic figures on energy saving and carbon emission reduction. The 12th five-year (2011-15) energy development plan, announced on 15 March, promises to cut energy consumption by 16 per cent per unit of gross domestic product (GDP), compared with 2010, as well as cutting carbon dioxide emissions by 17 per cent per unit of GDP, all by the end of 2015. From 2006 to 2010, China reduced its energy consumption by 19.1 per cent from 2005 levels, close to the 20 per cent target that was set. 'As compared with the previous five-year plan, the 16 per cent [energy intensity reduction] is modest and more realistic,' says Wang Yi, an energy expert and deputy director of the Institute of Policy and Management, at the Chinese Academy of Sciences. At the Copenhagen climate change conference in 2008, China promised to cut carbon emissions by 40 to 45 per cent for every unit of GDP by 2020 compared with 2005 levels. 'If the 16 per cent goal is finished by 2015, then the 40 per cent emission cut per unit of GDP by 2020 is easier to realise,' Wang told Chemistry World. The national energy plan is divided into different regional goals. For more advanced regions like Shanghai and Jiangsu, the goal is to cut 18 per cent, and for Beijing, it is 17 per cent. But for the least developed Chinese regions the target is 10 per cent. The 12th five-year plan also stipulates that non-fossil fuels should account for 11.4 per cent of the total energy consumption, but it does not mention China's total energy consumption goal for 2015, which is widely believed to be 4 billion tonnes of standard coal. This means, despite the energy saving efforts, China will still emit more than 10 billion tonnes of carbon dioxide (one unit of standard coal is equal to 2.6 units of carbon dioxide) in 2015, the same as the US and EU combined. Hu Jinglian, a senior expert at the Energy Research Institute of the National Development and Reform Commission in China, thinks that even reducing by 16 per cent per unit of GDP, is still a difficult target to reach. 'It will depend on the growth rate of GDP. If it is kept as high as 10 per cent annually, it will be a great challenge to cut energy intensity,' Hu says. She adds that China should have a national government agency to make a comprehensive energy saving plan, rather than simply setting a target. Researchers have identified the mechanism by which some antidepressants stimulate the formation of new brain cells, an insight that could lead to improved drugs. Antidepressants combat depression by increasing levels of serotonin in the brain. But they can also help by stimulating the formation of new brain cells, a process called neurogenesis, which plays an important role in memory. 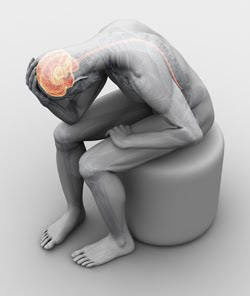 Depressed patients are thought to release greater amounts of glucocorticoid stress hormones, such as cortisol, which reduce neurogenesis, causing symptoms such as impaired memory and low mood. Previous research has shown that antidepressants block the effect of the glucocorticoid hormones and restore neurogenesis, but the mechanism by which this happens was unknown. Now, scientists at King's College London in the UK have found that antidepressants affect neurogenesis by interacting with the glucocorticoid receptor, leading to expression of key genes needed for stem cells to differentiate and proliferate. The group exposed cultures of human stem cells from an area of the brain called the hippocampus to a range of antidepressants, including sertralene, which is marketed as Zoloft by Pfizer. 'We've seen that the glucorticoid hormones and the antidepressants activate the same protein, called the glucorticoid receptor,' explained Christoph Anacker, who led the study group. 'But they activate this receptor in very different ways'. Glucocorticoids decrease neurogenesis, whereas antidepressants increase it. The researchers say that their work provides a model for depression in the laboratory and a platform for drug discovery to develop antidepressants that are more effective and lead to fewer side effects. 'It demonstrates that antidepressants have effects which go beyond simply increasing the transmission of serotonin in the brain,' says Daniel Smith, an expert in clinical psychology at Cardiff University, UK. 'Current antidepressants have quite a broad range of effects and interact with a large number of different receptors in the brain.' 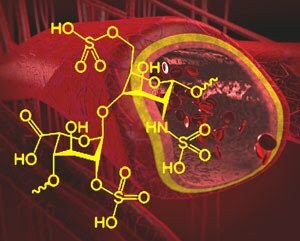 The work could lead to new drugs that target the glucocorticoid receptor more specifically, he adds. By 2020, depression is expected to be the second most damaging disease globally as measured across a range of indicators. One in five women and one in 10 men are likely to experience the disease at some point. Speciality chemical companies Solvay and Rhodia, have agreed to a deal that will see Solvay purchase Rhodia for 3.4 billion (£3 billion) in cash. The move will create a European chemical giant with annual sales of 12 billion. Key products for Solvay include speciality polymers, sodium carbonate and hydrogen peroxide. Solvay employs 17,000 people, and in 2010 it made sales of 7 billion. Rhodia makes: materials from silica and rare earth elements; products for consumer markets, such as surfactants, natural polymers and acetate; engineering plastics based on polyamide; and other products. 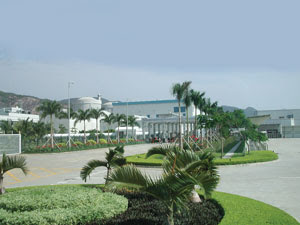 Rhodia employs 14,000 people, and it generated sales of 5.23 billion in 2010. Solvay sold its pharma business to Abbott for $5.2 billion in 2009, and in September 2010 it said it would cut 800 jobs worldwide. The two companies say that combining their activities will lead to annual savings of 250 million within three years. But two thirds of the money saved will come from outside the new company, and therefore they are not planning any 'major' downsizing as a direct result of the move. The deal follows DuPont's $5.8 billion (£3.5 billion) deal for Danisco and Clariant's 2 billion deal for Süd-Chemie. According to Constantine Biller, director and senior analyst for chemicals at UK corporate finance advisory firm Clearwater, this marks the end of the period of 'bolt on' acquisitions. 'Groups are now looking at diversifying their product areas and geographic reach,' he says. 'Rhodia takes Solvay into more growth markets.' When viewed together, the two companies currently generate 40 per cent of sales in emerging markets. Biller says there are lots of companies with 'reinforced' balance sheets looking for similar acquisitions. Companies in Europe and North America are motivated by growing demand in the so-called N11, the 'next 11' growth economies, as well as the bric countries (Brazil, Russia, India and China), he adds. Holograms displayed using interactions between light and the collective oscillations of electrons on the surface of a metal, known as surface plasmons, are set to transform three-dimensional imaging technology. Satoshi Kawata and his team from Japanese research insitute RIKEN's Saitama campus have constructed images that, unlike credit-card holograms, appear in the same natural colours from any angle. Lasers are still needed to make the hologram. 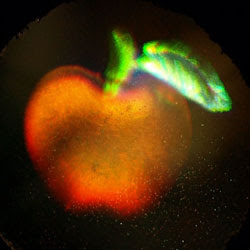 Team members Miyu Ozaki and Jun-Ichi Kato illuminate objects with red, green and blue lasers and the light beams diffract onto a glass sheet covered in a 150 nm thick layer of photoresist material, recording the image. 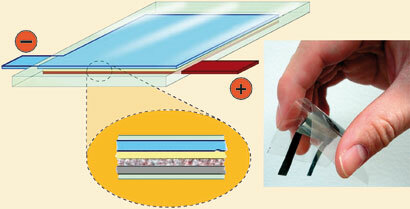 To make the plasmon hologram, the scientists coated 55 nm silver and 25 nm glass layers onto the photoresist. Shining light into the hologram through a prism from three different angles, one for each colour, reconstructs the three-dimensional image. 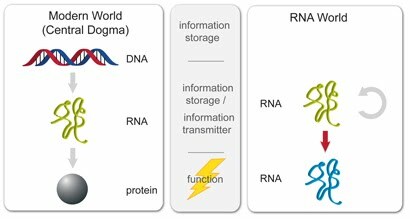 The so-called RNA world hypothesis has gained fresh momentum with the synthesis of the longest lab grown RNA strands made using an enzyme that is itself made of RNA, an 'RNAzyme'. Philipp Holliger and his team at the Medical Research Council laboratory in Cambridge, UK, developed an RNAzyme that makes RNA strands comprising up to 93 bases. In 1968, Francis Crick suggested that the first enzyme might have been made from RNA, and from this idea came the 'RNA world' hypothesis, in which life began with an RNA molecule that gained the ability to self replicate. 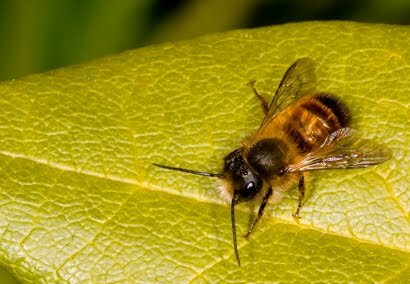 The hypothesis has since generated huge interest in the scientific community, and the wider public, but it remains unproven. Scientists identified the first RNAzyme in the early 1990s. In later work, they picked mutants of that structure to grow longer, but the chains were still relatively short chains, typically comprising about 20 bases, and the bases were put in the same sequence despite changing the mutant. Holliger normally works on the more familiar enzymes made of proteins. By introducing evolutionary pressure, the group was able to selectively improve the enzyme and then combine the best bits of their experiments to make a new RNAzyme that replicates faster and more reliably than previous attempts. 'The pressure was just the right kind of pressure' says Gerald Joyce, who studies the evolution of RNAzymes at Scripps in California, US. Holliger was able to add 'some really nice technical twists to select for polymerisation', he explains. 'Molecular evolution is a powerful process and allows us to rapidly identify RNA molecules with a desired activity' adds Holliger, explaining how the group found their 'needle in the haystack'. As well as making longer strands of RNA, the RNAzyme can also make enzymatically active RNA molecule, something Joyce says is extremely significant. Holliger says he hopes that his work, along with that of other groups, will provide sufficient clues to 'replay the tape' and plot a likely course for how life began. 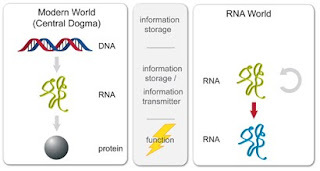 'The mindset in the field is let's just make an RNA world so we can see one in motion,' says Joyce. 'There's only one example of life that we know of wouldn't it be cool if we had another example, even if it was synthetic biology,' he adds. 'There are still some formidable challenges ahead,' Holliger says. But the development of self-replicating RNA would be an enormous step forward. 'It's pretty clear where you'd go from there,' he adds. 'The galvanic cell's electrochemical performance exceeds that of lithium ion batteries,' says an expert in electrochemical energy storage at the University of Strathclyde. He finds it interesting that using a ruthenium oxide-based cathode can be applied to developing a hybrid energy storage and power supply system. 'The mechanical flexibility and malleability of our cell will have a positive impact on miniaturisation. Imagine, for example, an ultra-thin battery moulded to the case of a laptop! Clearly, this will enable more room for the electronic payload,adds Lowy.